How to Stay Motivated—Changing the Picture(byZig Ziglar) is presented by Made for Success. Thisstandaloneaudiobook app combines a professional audio recordingwithsupplemental features for download-once, grab-and-goanywhereenjoyment. Zig Ziglar, acknowledged master of motivation and of boththevalues and strategies that lead to success, offersthirty-eightlessons in how to re-focus your thoughts and energiesto become theperson you want to be and live the life youdesire. How to Stay Motivated—Changing the Picture provides youwithclear and proven techniques to use to enhancerelationships,improve your self-image, set and achieve goals, andso muchmore! Apply these winning steps from the motivational master himselftobuild a better, more productive, satisfying life for yourselfandyour family. Change your picture and change every facet ofyourlife. Sell to Anyone (by Zig Ziglar and Brian Tracy)is presented by Made for Success. This standalone audiobook appcombines a professional audio recording with supplemental featuresfor download-once, grab-and-go anywhere enjoyment.Your ability to prospect and sell depends on your skills inworking with anyone. Two of the world’s top sales trainers cometogether to teach you little known sales traits that are guaranteedto make a huge impact on your sales performance.Your ability to prospect and sell depends on your skills inworking with anyone.First, you will understand from the world’s top motivationalspeaker, Zig Ziglar, how to train your voice inflections toovercome the five most common sales objections. Your voice can makeall the difference in phone sales and presentations, and you willlearn how to close more sales by controlling your voice.Brian Tracy will guide you through 21 qualities of top tenpercent sales performers, with practical and easy-to-implement tipson establishing instant rapport and credibility with yourcustomers.Work to double your sales effectiveness from the convenience ofyour car or while you workout with this powerful “must have” seriesof value-packed audios. Verbal Mastery Vocabulary System: Expand YourVocabulary & Verbal Communication (by Brian Tracy, LarryIverson, et al.) is presented by Made for Success. This standaloneaudiobook app combines a professional audio recording withsupplemental features for download-once, grab-and-go anywhereenjoyment.A choice selection of the most useful words to add to or usebetter in daily, workplace, or public speaking settings to gain inclarity, credibility, and augment earning capacity.It’s a multi-session communications retreat in a box! And withVerbal Mastery, this eleven-part audio program, you’ll haveunlimited access to the world’s top communication experts any timeyou want.Become a clever conversationalist and confident communicator,never at a loss for words in any social or work situation. Fromyour choice of words to how to use them to work a room, the VerbalMastery audio suite offers hours of techniques to increase yourspeaking power.Finally, master the language of success and become a verbalsuperpower with George Walther’s Power Talking: What You Say IsWhat You Get.The four-part verbal power system includes powerful andpractical words selected from authoritative, respected sources suchas the Wall Street Journal and New York Times. Included are 750essential words you need to speak fearlessly, command more respect,gain credibility, write with greater clarity, reduce socialawkwardness, and, most importantly, increase your earningpotential. As A Man Thinketh (by James Allen) ispresented by Made for Success. This standalone audiobook appcombines a professional audio recording with supplemental featuresfor download-once, grab-and-go anywhere enjoyment.This is one of the greatest and best-selling self-improvementbooks ever written! For anyone who wants an enriched life and amore meaningful existence, this is a must-listen. Written in 1902,it is regarded as one of the founding books of self-improvementliterature. It has been embraced by groups as divergent asChristian fundamentalists, those who cite the Laws of Attraction,and those who study history, philosophy and psychology. JamesAllen’s teachings invoke both faith and common sense. Morning and Evening (by Charles H. Spurgeon)ispresented by Made for Success. This standalone audiobookappcombines a professional audio recording with supplementalfeaturesfor download-once, grab-and-go anywhere enjoyment.Morning and Evening is an inspiring devotional whichoffersChristians of all denominations a daily dose of CharlesSpurgeon’swit and wisdom through a daily tour of thescriptures.Morning and Evening by Charles H. Spurgeon (1834–1892) is oneofthe most popular daily devotional series of all time. Joinmillionsof people who start and end their day throughout the yearbylistening to these timeless devotionals. In this audiobookversion, Christopher Glyn’s rich voice with an English accentmakesCharles H. Spurgeon’s rich, 19th Century English prose easyfor themodern listener to understand. Enjoy the depths of thescripturesand by setting your mind on God each day. Devotions From Psalms and Proverbs (by CharlesH. Spurgeon) is presented by Made for Success. This standaloneaudiobook app combines a professional audio recording withsupplemental features for download-once, grab-and-go anywhereenjoyment.Enjoy this 17-week collection of unique meditations on keyscriptures from the Psalms and Proverbs by Charles H. Spurgeon(1834 - 1892), one of the most popular authors all time.Taken from his celebrated “Morning and Evening” meditations,these devotional readings offer Christians of all denominations anuplifting dose of Charles Spurgeon’s wit and wisdom as he meditateson the deeper meaning of key scriptures. In this audiobook, Britishnarrator Christopher Glyn’s expressive reading brings Spurgeon’srich, 19th Century English prose alive for the modern listener. Public Speaking Survival Kit: Expert Trainingto Dazzle Your Audience (by Brian Tracy and Dianna Booher) ispresented by Made for Success. This standalone audiobook appcombines a professional audio recording with supplemental featuresfor download-once, grab-and-go anywhere enjoyment.Learn how to create and deliver a dazzling speech for anyoccasion.Effective public speaking starts here. In this self-paced audioseries, two of the world’s top communicators share the powerfultechniques they have developed in their experience speaking tomillions of people.In addition to the basics of public speaking, you’ll learn howto think on your feet, play off your audience, and banish anxietyand stress. Make your next speech a dynamic presentation full ofenergy and personality from the podium.Inspired by bestselling public speaking programs by DaleCarnegie, you will understand how legendary communicators likeWinston Churchill, Ronald Reagan, and Bill Clinton can move thehearts and minds of an audience with humor, statistics, andstories.Develop confidence and charisma from the convenience of your caror while you work out with this powerful “must have” series. Thesetechniques will guarantee that you will be competent and composedfor your next presentation. Secrets of Closing the Sale (by Zig Ziglar) ispresented by Made for Success. This standalone audiobook appcombines a professional audio recording with supplemental featuresfor download-once, grab-and-go anywhere enjoyment.Doctors, housewives, ministers, parents, teachers … everyone hasto “sell” their ideas and themselves to be successful. This newguide by America’s #1 professional in the art of persuasion focuseson the most essential part of the sale—how to make them say “Yes, Iwill!”All of us are involved in selling every day. Whenever we presenta product or a principle, inform a client, or instruct a child, weare engaging in the art of effective persuasion. Allow America’smaster of the art of selling to explain proven, practical salestechniques all of us can use every day. Zig Ziglar provides vitalstrategies for specific closes, hundreds of sales questions, anddozens of persuasion techniques to help everyone sell their ideas,or themselves. No matter what your age, gender, occupation, orlifestyle, these proven techniques from America’s selling sensationcan work for you. Think and Grow Rich (by Napoleon Hill) ispresented by Made for Success. This standalone audiobook appcombines a professional audio recording with supplemental featuresfor download-once, grab-and-go anywhere enjoyment.Think and Grow Rich is the 1937 masterpiece that remains a majorinfluence on all motivational teachings to this day.Think and Grow Rich is a motivational personal development andself-help book by Napoleon Hill, written to follow up on andsummarize the teachings of his 1928 multi-volume, The Law ofSuccess.His research started when Andrew Carnegie (the steel tycoon whowas then the richest man on earth) gave him the assignment oforganizing a Philosophy of Personal Achievement. Napoleon Hill, whowas a poor journalist, armed with just an introductory letter fromCarnegie, set out to interview over five hundred successful peopleincluding Henry Ford, Thomas Edison, Alexander Graham Bell, John D.Rockefeller, George Eastman, William Wrigley Jr. and Charles M.Schwab. He derived 16 lessons of success from these studies, thentranslated those into the 13 steps to success in Think and GrowRich.While the book’s title suggests that Hill focuses only on how toachieve monetary wealth, the author explains that the philosophy heteaches can be used to help anyone do or be almost anything theywant in this world. Zig Ziglar’s Leadership and Success Seriesispresented by Made for Success. This standalone audiobookappcombines a professional audio recording with supplementalfeaturesfor download-once, grab-and-go anywhere enjoyment.Zig Ziglar in this seminal collection teaches the essentialandeternal principles of leadership which are vital to anyendeavorand will aid in every profession.World renowned author and speaker Zig Ziglar (with aguestappearance by Tom Ziglar) teaches timeless principles ofleadershipthat can help you become a strong leader in anyvocation.Not only that, he helps listeners develop a deeperunderstandingof success by understanding principles of achievingsuccess in lifeand business. His advice includes a nine stepprogram that detailshow to develop a winning attitude to help youachieve optimalsuccess.A positive attitude is key to becoming a good leader andlearninghow to build people up in order to keep your businessgrowing.Develop a positive outlook on failure, and understand whyit is anevent and not a person. The manner in which you treatpeople willpay rich dividends.Everyone is born with qualities to achieve success. Let themostsought after motivational speaker in the world help youdevelopyour success while you lead. How to Stay Motivated: Qualities of Success(byZig Ziglar) is presented by Made for Success. 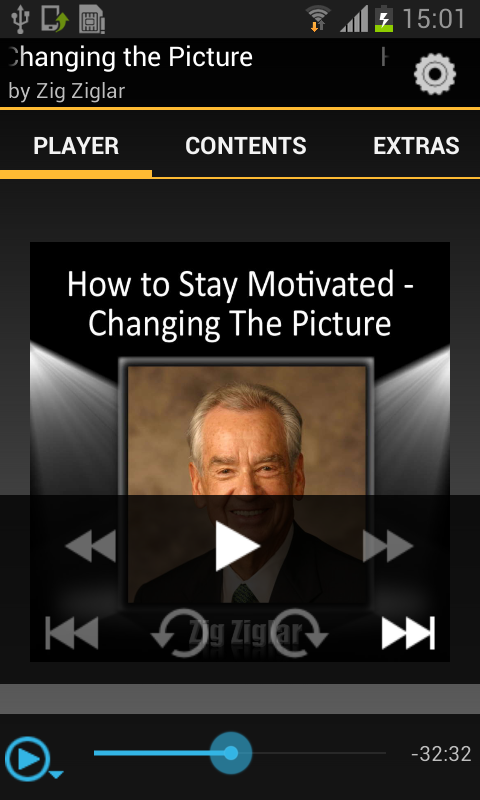 Thisstandaloneaudiobook app combines a professional audio recordingwithsupplemental features for download-once, grab-and-goanywhereenjoyment.Learn, with Zig Ziglar’s book, How to Stay Motivated, howtoapply techniques to stay motivated and be successful withinvariousaspects of your life. It provides you with clear andproventechniques to use to enhance relationships, improveyourself-image, set and achieve goals, and so much more! Learn howtoapply these motivational qualities to achieve success inlife.Apply these winning steps from the motivational master himselftobuild a better, more productive, satisfying life for yourselfandyour family. Change your picture and change every facet ofyourlife. A Conversation on Character (by Zig Ziglar)ispresented by Made for Success. 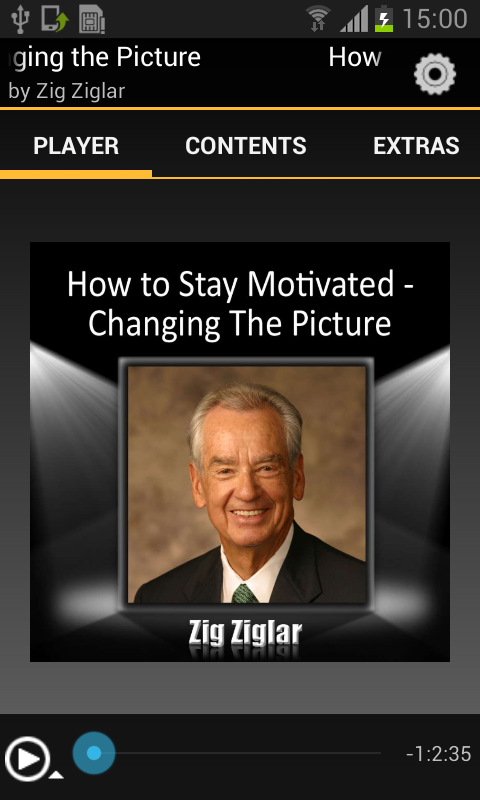 This standalone audiobookappcombines a professional audio recording with supplementalfeaturesfor download-once, grab-and-go anywhere enjoyment.A conversation with Zig Ziglar relating his experience thattheroad to true success requires a character marked withhonesty,integrity, goal orientation, passion, and love. How to Stay Motivated: The Goals (byZigZiglar) is presented by Made for Success. This standaloneaudiobookapp combines a professional audio recording withsupplementalfeatures for download-once, grab-and-go anywhereenjoyment.Learn, with Zig Ziglar’s book, How to Stay Motivated, howtoapply techniques to stay motivated and be successful withinvariousaspects of your life. It provides you with clear andproventechniques to use to enhance relationships, improveyourself-image, set and achieve goals, and so much more! Learn howtoapply these motivational qualities to achieve success inlife.Apply these winning steps from the motivational master himselftobuild a better, more productive, satisfying life for yourselfandyour family. Change your picture and change every facet ofyourlife.